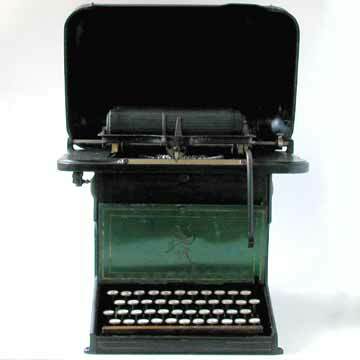 The Sholes & Glidden was the first typewriter sold in considerable numbers. About 5,000 of them were made between the year of introduction (1874) and 1878 when the Remington 2 appeared. The model presented here is the Perfected Sholes & Glidden, that was the last in the series of six basic models. 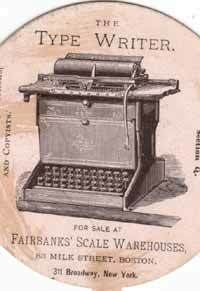 The same machine was also offered for sale as the Remington 1. The story of Christopher Latham Sholes, inventor of the Sholes & Glidden will be told in the history section of this museum. Information here is limited to the machine itself. The Sholes & Glidden originally appeared mounted on a sewing machine table, with a treadle to operate the carriage return. After all, the Remington factory where the first machines were built, produced sewing machines. The treadle was dropped, but the sewing machine table stayed. 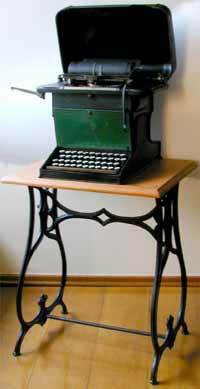 Other typewriter producers later on also built these tables with the simple wooden top and the cast iron legs, such as Oliver and Caligraph. After the introduction of the Remington 2, Wyckoff, Seaman & Benedict offered the Sholes & Glidden for sale as the Remington 1, as shown in this trade catalogue illustration. Not only did the first Sholes & Gliddens have a sewing machine table, they also had elaborate sewing machine decorations on them. Consciously or unconsciously Remington seemed to aim for a market of women. 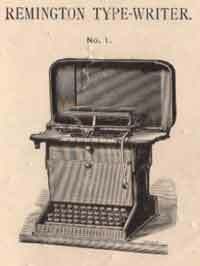 But the decorations were dropped on the Perfected machine, that came with a carriage return lever, a scale, a lid over the keyboard and a large cover over the carriage. Many of the features of the Sholes & Glidden also appeared on the Remington 2, like the wooden roll and the basic structure of the carriage.